These custom counter mats are an exciting advertising alternative to traditional floor standing or wall mount sign displays. When strategically placed in point of sale or service areas, these countertop accessories are an ideal way to attract customer attention. Whether pre-printed with customized graphics or holding DIY signage, high visibility custom counter mats help increase sales by upselling, cross-selling, or simply increasing brand recognition. These promotional sign holders are designed for use in places that shoppers are sure to notice: the service desk, checkout areas, and information kiosks. Businesses such as bars, banks, and retail stores buy counter mats to use in lieu of floor stands or wall signs that can quickly take up useable space. Service establishments and professional offices use these promotional counter mats for advertising in carrels and kiosks where customers fill out information. 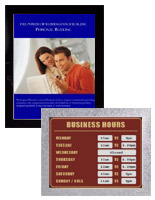 The simple design of the styles featured here for DIY signage make changing promotions and specials a snap. 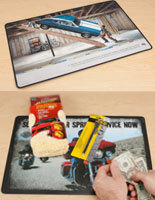 Banks use this counter mat to showcase the latest rate sheets or giveaways. 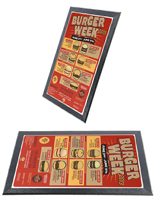 Restaurants and fast food establishments use custom counter mats, often called countertop register sign holders, to inform customers of new menu items or specials. Professional offices and service businesses often use these accessories as pre-printed mouse pads for branding and trade show use. 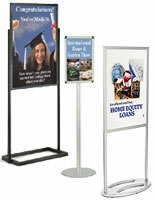 These lightweight, economical displays are a sure way to attract attention in any environment. Can these countertop register sign holders be used as a mouse pad? 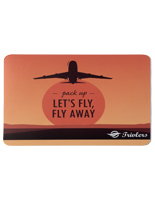 Small custom counter mats are ideal for use in commercial or office environments as mouse-friendly surfaces displaying pictures or custom logos. 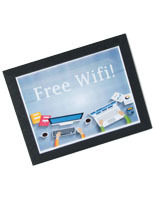 Protective coverings and scratch-resistant surfaces protect the displayed photo or sign. Full-color UV printing turns graphics and logos into durable spill-resistant countertop displays for high traffic areas. Slide-in styles offer hard and flexible cover options designed to resist damage from pens as well as computer mice. 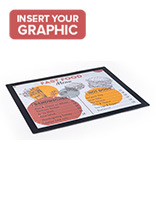 Are these countertop sign mats waterproof? Most of our slide-in countertop display units can withstand small spills but should not be completely submerged. Hard-top counter mats for bars and restaurants are easily wiped clean as needed using a damp cloth. Customized UV printing processes create brilliantly colored branded displays that are fade-resistant as well as water resistant. The designs of these commercial counter mats vary slightly. Styles with plexi tops include magnetic framing that keeps the graphic and non-glare lens together. Acrylic types range from flexible styles to hard, scratch resistant surfaces suitable for use by customers writing checks at the store register or filling out forms in banks and service areas. 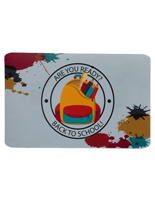 Pre-printed counter mats include full-bleed graphics that go to the edge, or stylish edged versions with black borders for contrast. 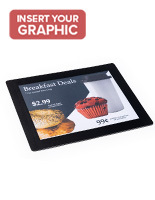 Slide-in styles allow customers to quickly change graphics by printing logos, messaging or advertisements and inserting them in one of these unique countertop register sign holders. To change-out promotional signage or prints simply lift the top non-glare lens off to change or replace the displayed image. 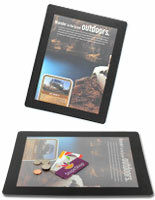 Rubber and non-skid backing make these versatile countertop mats ideal for high traffic areas. Register stands in point of sale checkout locations use these fixtures as a branded base customers to write out checks or sign credit card receipts. Customer service and information kiosks find that displaying a custom logo or list of new products often leads to increased sales. 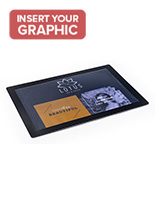 For establishments that need to change graphics or advertisements frequently, slide-in countertop mat displays are the perfect solution. Along with the large selection of sign holders seen here, there is a wide variety of point of purchase tools that can be seen in our online categories. View all of the supplemental options beyond in store POP displays, including promotional booths and trade show fixtures, wall display cases, poster and sign frames, and custom printed retail merchandising options. Displays2go offers more than forty years' experience manufacturing and distributing sales and marketing accessories and stands. Our ever-increasing selection offers not only a huge variety of in-stock merchandise able to ship the same day as ordered, but highly competitive pricing that is ideal for single orders, small business, and residential use as well as bulk corporate ordering.